The Modular Closed Loop architecture offers the ability to achieve up to 36 kW per rack of cooling power in one specific assembly. This type of architecture can be especially useful when planning to install a few very high power racks into a facility as the racks do not release any heat out into the data center environment. It is also an ideal solution when rack space is limited (for example, in an atypical server room of a mid-size company) and when the cooling becomes an issue because of high density applications housed there. The module can consist of a virtually unlimited number of racks and CoolTeg cooling units. We recommend 6 racks (252 - 288U) as a limit where standard data center layout should applied. Both cooling unit versions, chilled water (CW) as well as direct expansion (DX), are available to provide the module with needed cooling power up to 36 kW per rack. Cooling units are connected to the coolant piping through the bottom frame. A top connection is available as an option. The dimensions of every cooling units are - 300 mm width, 1200 mm depth, 42, 45 or 48U height. The modular architecture is pre-designed for 1200 mm deep, 600 or 800 mm wide and 42, 45 or 48U high RSF racks and for 1200 mm deep, 300 mm wide and 42, 45 or 48U high side mount cooling units. The module can consist of a virtually unlimited number of RSF racks and cooling units. 6 racks (252 - 288U) could be understood as a limit where the application of standard data center layout should be considered. The configuration of the rack differs according to its position in the module - please be aware of it when planning the module. All racks are delivered fully assembled with the necessary passive airflow management installed. 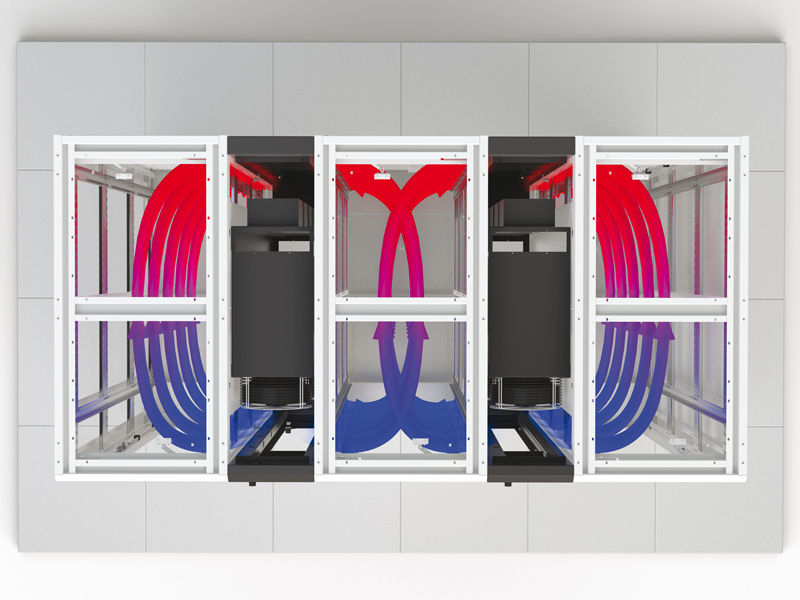 The Modular Side Closed Loop can be configured according to the needs of any individual customer and can be modified and completed with additional racks and cooling units, as required in the future. The module can consist of a virtually unlimited number of RSF racks and CoolTeg cooling units. We recommend 6 racks (252 - 288U) as a limit where the standard data center layout should be applied. The number of cooling units depends on the expected heat load, designed cooling capacity and redundancy level. We always recommend consultation with our technicians. All cooling unit versions - chilled water (CW) as well as direct expansion (DX and XC) - are available. Their cooling capacity mainly depends on the air and coolant temperatures. Chilled water units can reach up to 36kW of cooling capacity. Cooling units are connected to the coolant piping through the bottom frame or from the top. The dimensions of every cooling unit are - 300 mm width (XC unit – 400mm), 1200mm depth, 42, 45 or 48U height. The modular architecture is pre-designed for 1200 mm deep, 600 or 800 mm wide and 42, 45 or 48U high RSF racks. All racks are delivered fully assembled with the necessary passive airflow management, grommets, and separation frames installed. The Modular Closed Loop can be configured according to the needs of any individual customer, and equipped with an emergency door opening system, fire-fighting system, monitoring devices etc. Each component is checked by our Quality Control Department before delivery. With our product managers´support you will be able to select the most suitable rack type for installation of any instrumentation, its power supply, cooling or just maybe only the correct system of cable management.